Omaha poker’s rapid rise to popularity makes it the second most played variation in the world, right next to Texas Hold’em. As a derivative of the Texas variety, Omaha Hold’em is easy to learn, but it’s crucial differences make it an exciting alternative with fast action, big pots, and a draw for both professionals and amateurs alike. Here we’ll outline how the game is played, the rules, different types of the Omaha card game, as well as give you some strategies to beat out your opponents and win big. While the rules for Omaha Hold’em stay the same regardless of the style you play, the type of game or tournament will determine how much you can bet, and who gets paid when they win. There are four types of games. Pot Limit Omaha Poker- Also referred to as PLO, this is the most common way to play Omaha poker. Here, a player can bet up to what’s in the pot on each turn. For example, if there’s $100 in the pot, the maximum bet on that round for an individual is $100. No Limit Omaha Poker- Here a player can bet any amount they have available in chips. Fixed Limit Omaha Poker- Like other fixed limit games, this means there is a specific maximum amount a player can bet per round and per game. Omaha Hi-Lo- This common variation can be played with any one of the limits discussed above. The difference here is that the pot winnings are split evenly between the highest and lowest hands. It is possible to hold both the highest and lowest hands simultaneously, like in the example of an Ace, 2, 3, 4, 5 straight. In this case, the winner would receive the entire pot. Here’s a rundown of the basics for each phase of the game. To win at Omaha Hold’em you need the best possible combination of five cards. Every player will receive four hole cards, and you can use only two of those to make your hand. You will also have access to five community cards that appear in the flop (three cards), the turn (one card), and the river (one card) to make your combination. The best hand of two hole cards and three community cards will get the pot winnings. If you’re playing a Pot Limit or No Limit game, the game is referred to by the size of the blinds. For example, a $1/$2 Omaha game will have a small blind of $1 and a big blind of $2. The blind moves clockwise and the player to the left of the big blind will be the first to bet. In Fixed Limit games, the big blind is the same as the small bet. The small blind is traditionally half the size of the big blind but could be larger depending on the house rules or the stakes. Each player can call or raise the big blind, or fold after examining their four hole cards. The being structure may vary based on the different styles of the game, and we’ve included information on that below. Betting continues around the table until all players who have not folded have placed equal bets in the pot. After each player either bets or folds, the dealer places the next three cards face-up on the board. Referred to as the flop, this is the first round of community cards that are available to all active players. The person immediately clockwise from the button begins the round of betting until everyone at the table has either folded or called. Following the betting action in the flop round, a single card is dealt face-up on the board. Referred to as the turn, this is the fourth community card in the game. As with previous rounds, play begins with the individual to the left of the button and every player can either fold, call, or raise. The last chance community card is called the river, and like the turn, it is a single card dealt face up on the board. All remaining players have an opportunity to act, starting with the one immediately clockwise from the button. After the final round of betting, it’s time for the remaining players to show their cards. If there was more than one person left at the end of the round, the last person to bet or raise reveals their cards first. If there was no bet or raise on the final round, the player immediately clockwise of the button flips theirs over first. The player with the best five-card combination that includes two of their hole cards and three of the community cards wins the pot. Although it’s unlikely if there are ever two hands that are identical the pot will be split equally amongst those with the best hands. Once the winnings are paid, the button moves clockwise to the next player, and you’re set to start another round. Omaha poker rules are the mostly the same regardless of whether you’re playing Fixed Limit, No Limit, or Pot Limit games. There are a few exceptions, and these are the most common. Players need to bet a minimum of the size of the big blind in each round, but can always bet up to the size of the pot. If you want to raise, the amount needs to be at least as much as the previous bet or raise in the same round. For example, if the first to act bets $10 and you want to raise their bet, you will need to raise by a minimum of $10 for a total bet of $20. The maximum raise for every bet is the size of the pot. This includes the total of the active pot, plus all bets on the table, as well as the amount the active player needs to call before they raise. In every round of Pot Limit Omaha, there is no cap on the number of raises allowed. The minimum bet in No Limit Omaha is the same as the amount of the big blind. However, players can bet as much as they want each hand and round, as long as they have it available in chips. In No Limit games, the minimum raise needs to be as much as the previous bet or raise in the same round. There is no cap on the number of raises allowed in each round. All betting in Fixed Limit Omaha is in a structured, pre-determined amount. All bets and raises before the flop and after the flop are the same amount as the big blind. Following the turn and river cards, the bet and raise amounts double. Up to four bets are allowed per player during each betting round including their initial bet, raise, a re-raise, and a final raise or cap. Also called Omaha 8-or-better or simply Omaha 8, Omaha Hi/Lo has a few rules unique to this version. Players will split the pot between the highest and lowest poker hands, giving players the opportunity to win half, or win it all with a particularly good low hand. A five-low straight (five, four, three, two, and ace), also known as a Wheel could win both the highest and lowest pots. Like all variations of poker, Omaha Hold’em requires skill and strategy. Whether you’re a beginner or a seasoned player, these three tips can help you hone your gameplay and give you an advantage against weaker opponents. One of the biggest mistakes Omaha players make is getting overly excited about great hole cards. Getting excited about an initial hand that features all of the same suit or three of a kind is a mistake. Although these can feel like an easy win, it’s important to remember that you can only use two of the cards in your hand to create your win. 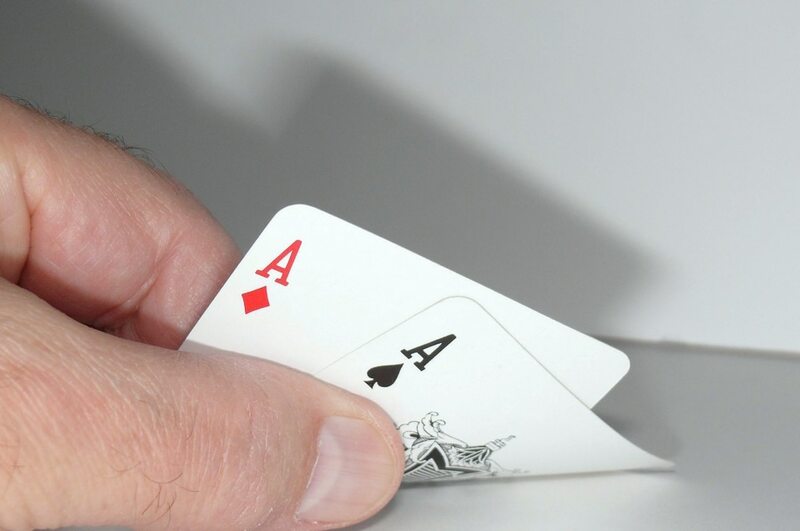 If, for example, you’re holding three of a kind, it’s improbable that you’ll see another of your cards during the flop, turn, or river. This reduces your fantastic hand to nothing better than a pair and reduces the possibility to create a genuinely stellar hand. Identifying worthless hands is one of the hardest skills for new players to master, but it’s one of the most valuable. Learn to analyze hole cards for possibilities, and accept if what you’re holding doesn’t have the possibility of becoming a winner. Many experts agree that it’s better to fold than be forced to bluff your way through later, more expensive rounds. Especially since it’s likely that your competitors have a hand that will beat yours. The best starting hand in Omaha is one that has strong cards that work collaboratively to give you a good chance to make a great combination. If you have a pair, suited cards, connected cards, or complimentary cards, you’re in an excellent position to make something happen. If you’re playing Hi/Lo, be sure to pay attention to pairs of deuces or low cards as well as winning hand opportunities.